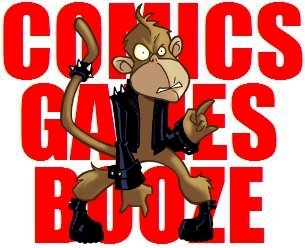 That F'ing Monkey: New Year, New Monkey! occasionalcomics.com. You should read it. We’re going to talk more about his awesomeness later this month. Anyway, the new monkey is named Punch and you’ll be seeing a lot of him around. Where will you see him? How about Facebook? That F’ing Monkey now has a page on Facebook. You can like us and stuff…yeah I’m not so good with the Facebooks. Search That-Fing-Monkey. If nothing else it’ll be an interesting train wreck, you should check it out! The old smoking monkey will be missed, but that image was pulled from an episode of the Clerks cartoon. Not something I could go on using forever. Besides, Punch is fantastic. Sunday also marks the first day of my new Holiday, All Swine’s Day. Think of it like Fat Tuesday. With the Holidays behind us, it is one last day to shove food into my face without feeling guilty. Celebrated the first Sunday of the New Year, All Swine’s Day is a pork packed brunch with close friends. We can start worrying about diets, workouts, etc after enjoying a day of breakfast excess. Fantastic is not a good enough word for Punch. FanF'ingTastical is more like it. Now considering buying a monkey and buying it spikes and teaching it to bring and open me Guinness cans.